After you swing by Antelope Canyon and take stunning photos of the sandstone sculptures, head to Horseshoe Bend in Arizona. Horseshoe is about five miles from Lake Powell. The above photo is the view you’ll see after walking from the parking lot to the beginning of the hiking area. 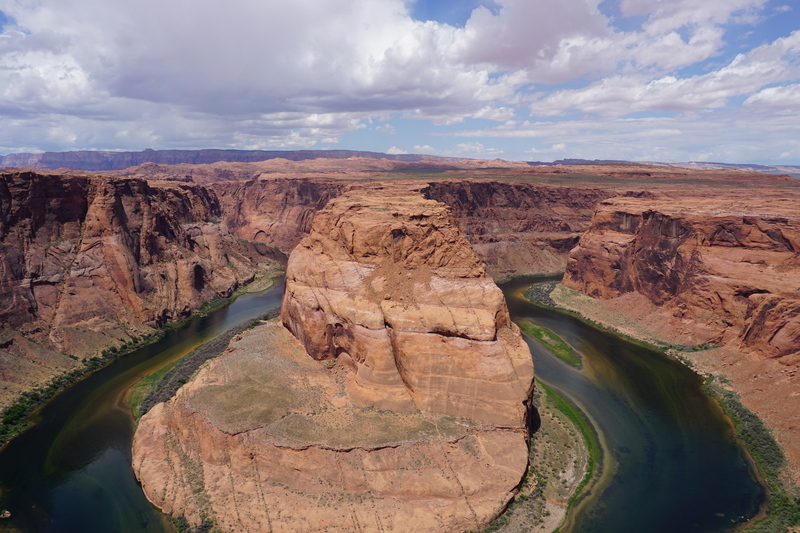 Once you hike to the steep cliffs, you will be rewarded with views of the curve in the Colorado River. The overlook is 4,200 feet above sea level, and the river is at 3,200 feet above sea level, making the drop 1,000 feet, experts say. Learn more about the hiking area here. It is crucial that visitors research the cliff areas before hiking to the ledge. Many of the areas are not entirely supported below the surface, and visitors could easily fall if the land beneath them crumbled. Sadly this happened in 2010 to a Greek man when the sandstone ledge gave way, and he fell to his death. We took these photos safely from the ledge and without a tripod. Visitors do not have to trade safety for an excellent picture. If you prefer not to bother with the hike or cliffs, check out this tour of Horseshoe Bend from the air. Have you been to Horseshoe Bend? What did you think?